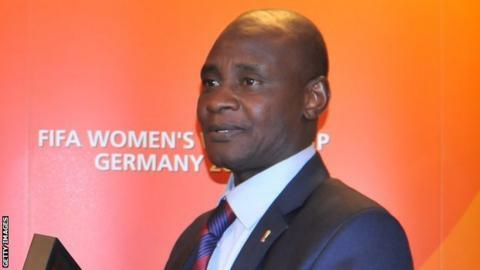 Nigeria Football Federation (NFF) president Aminu Maigari says he is not setting the Super Eagles any targets for the 2014 Fifa World Cup in Brazil. Despite coach Stephen Keshi's contract stating he needs to reach the quarter-finals, Maigari has distanced himself and the NFF from the targets. "You can't predict the future or make demands going into a big tournament like the World Cup," he told BBC Sport. "I think it's more reasonable to allow the team take it one game at a time." NFF vice-president, Mike Umeh, has been quoted as saying the Super Eagles have the talent to reach the semi-finals of the World Cup. He also said officials are expecting the African champions to surpass the quarter-final feats of Cameroon, Senegal and Ghana in previous World Cup. Goalkeeper Vincent Enyeama has even said the Super Eagles can win the World Cup. "I think it's unfair to put the team under so much pressure to reach the semi-finals. Some people can openly say things like this, but not the NFF," Maigari insisted. "We need to provide the right environment for them to thrive positively at the world stage and give Africa and Nigerians a campaign to be proud of. "Talks of semi-final, final and probably winning the tournament in Brazil is not coming from the football federation." In both 2002 and 2010 Nigeria exited the tournament disappointingly early. Significantly, Keshi has advised Nigerians to set realistic World Cup targets for the Super Eagles, as expectations from the team continue to heighten. "We have to be realistic because there are no small teams among the 32 going to Brazil, any of the teams will be tough," Keshi said. The Super Eagles coach further revealed that he is not looking to avoid any team in Friday's draws, as he believes his team will excel with proper preparation. "We have no preference of any of the countries to be our group. All we need do is to prepare well for every team and take the games one after the other." In the long history of the World Cup, only three African teams have ever reached the quarter-finals: Cameroon in 1990, Senegal in 2002 and Ghana in 2010.